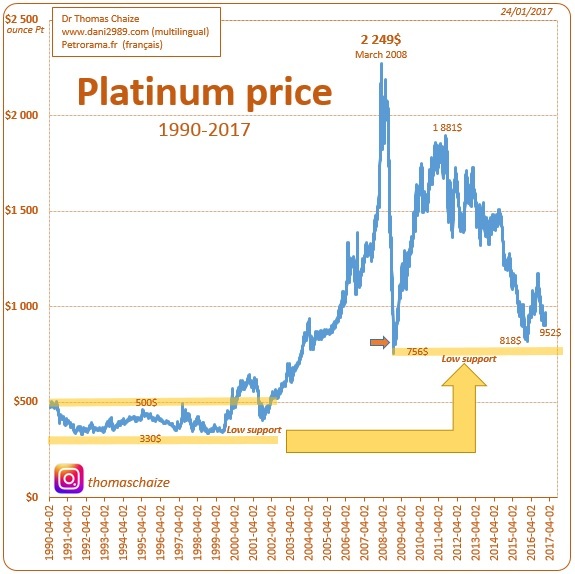 The price of platinum: technical analysis per ounce from 1990 to 2017. Where is today the price of platinum? Here are some answers with these two graphs. I. The price of platinum. 1. The price of platinum from 1990 to 2002. During the period between 1990 and 2002, the price per ounce of platinum was in a channel between $ 330 and $ 500 per ounce. In 2000-2002 the price of the ounce came out of its horizontal channel. The course went from $ 500 to $ 2,249 in March 2008. 1. Support from 1990 to 2002. From 1990 to 2002 the support was $ 330 per ounce. That is, the purchase area was $ 330 per ounce of platinum. III. Technical analysis and fundamental analysis. The production costs of one ounce of platinum have more than doubled since the 1990s, so it is normal for the low support to increase. What is shown by the technical analysis, the fundamental analysis confirms it. Read some annual reviews of mining companies in the platinum sector, you'll understand. 1. Platinum production from 2000 to 2006. Platinum production increased from 5 to 7 million ounces from 2000 to 2006 as a result of higher prices. 2. 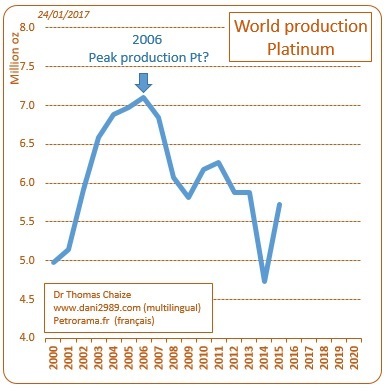 2006 peak production of platinum? Starting in 2006, platinum production begins to fall despite rising prices until March 2008. I would return in detail about platinum production in a few weeks. My previous topic on platinum is October 1, 2008 (I'm patient). This is the red arrow on the platinum price chart. When I wrote it, I thought we were in the low zone. Today I have the same feeling (But this is only my opinion, nothing more). Warning ! Nothing says that we will come out as fast as in 2008.